Shannon Sampert is an Associate Professor of Politcal Science at the University of Winnipeg and the director of the Media Centre for Public Policy and Knowledge Mobilization. She is the former editor-in-chief of EvidenceNetwork.ca and was the first female op-Ed editor for the Winnipeg Free Press from 2014-2017. She currently studies media treatment of women politicians. We look forward to seeing everyone on Friday. 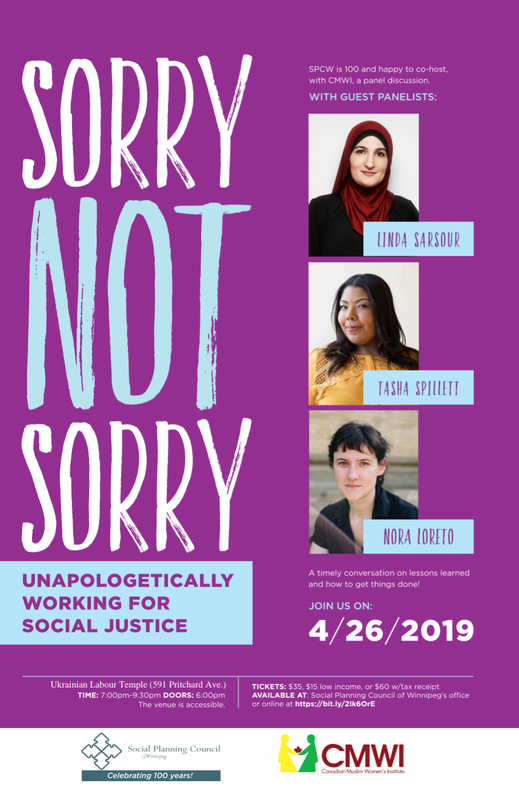 For those yet to pick up tickets, Tickets are still available for purchase at the Social Planning Council of Winnipeg (432 Ellice Ave) and Canadian Muslim Women’s Institute (201-61 Juno Street). So head on over to get your tickets or purchase your tickets online via Eventbrite. Venue: The Ukrainian Labour Temple, 591 Pritchard Avenue. Please note as renovations are pending, this venue is not fully accessible. There are 5 steps up to the main doors. Washrooms are located in the lower level and that is a flight of 14 stairs. Washrooms are not accessible in terms of fixtures, clearances, etc. There is a door at Pritchard and McGregor that could be used. The threshold is about 2 inches above grade. Once inside, it is only 3 stairs to the foyer level. Please contact info@spcw.mb.ca for more details. ASL interpretation will be provided. Please see our full media release here. Our original venue cancelled our booking due to reaction to one of our panel speakers, Linda Sarsour. We have delayed our further response to ensure we took the time to listen to concerns raised. We’d like to thank those who have approached us in the spirit of civil discourse. We understand that the situation in the Middle East is an emotional issue for many, however, it was never to be the focus of our event. Unfortunately, much of the negative reaction we received was hateful, violent, misogynistic and/or Islamophobic. We are expecting that the announcement of our new venue will engender much the same. We have added new links below to add to the discussion. For anyone who simply wants to know more, as always, please consider the source of any links (including ours!) for explicit, complicit, conscious or unconscious bias and, most importantly, please read past the headlines. There is a great deal of media coverage both critical and supportive of Ms. Sarsour. We will not engage further by listing more and more links. The ones we have chosen to share offer perspective and/or context on the most prevalent criticisms of Ms. Sarsour. While we will maintain a space for constructive dialogue, offensive, violent content will be blocked, deleted and reported. We also heard the concerns around polarizing or dividing Winnipeg. The best way to avoid division is to commit to the relationship in which we all share as Winnipeggers. The best way to remain in relationship is through respectful and caring dialogue. Our initial statement referenced colonialism playing a role in the establishment of Israel. This refers to how the world powers at the time, all with colonial histories, eager to absolve themselves of not doing all they could to prevent the Holocaust, forced a settlement of one people and the displacement of another. In 1948, people living in the region, who also claim rights to the region, were dispossessed of their property and possessions. Much harm to all has been the lasting legacy. Sorry Not Sorry was never a fundraiser. We wanted to mark our 100 years by looking forward, not back. We kept our ticket prices comparatively low as we wanted it to be as accessible as possible. The $60 ticket with partial tax receipt is to offset the low-income ticket of $15. Our date was chosen as it relates to the founding of our organization in 1919 and other General Strike commemoration events that we knew were in the planning stages. That there was a synagogue across the street did not resonate with us given that our intended discussion was not to be about the conflict in the Middle East. In hindsight, it should have. Our oversight has given the impression to some that we were intending to be offensive. This was not the case. However, we wholeheartedly apologize for that impression. We are very grateful to the Bear Clan, due to their commitment to community safety, for helping us out at this event. 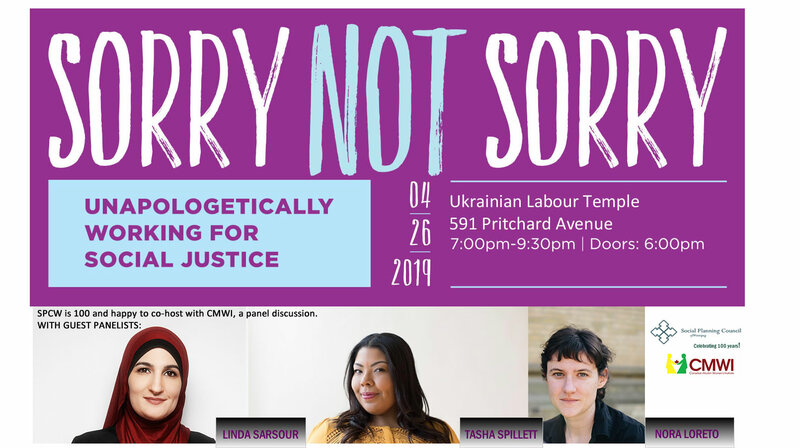 Tickets are available for purchase at the Social Planning Council of Winnipeg (432 Ellice Ave) and Canadian Muslim Women’s Institute (201-61 Juno St.) or online via Eventbrite. We are pleased to celebrate 100 years by partnering with the Canadian Muslim Women’s Institute in a discussion about working together to create a truly just society. 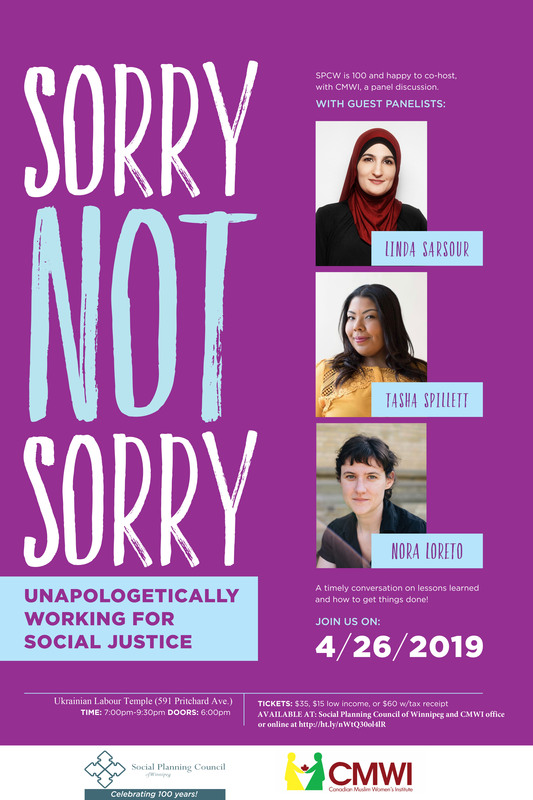 This amazing panel of activists, Linda Sarsour, Nora Loreto, and Tasha Spillett, will share their successes and perspectives on making the changes that challenge the status quo and addresses bias. A moderated question and answer session is scheduled to allow the conversation to be community based. Linda Sarsour is an award winning racial justice and civil rights activist, community organizer, every Islamophobe’s worst nightmare and mother of three. She is a Palestinian-Muslim-American born and raised in Brooklyn, New York. She is the former Executive Director of the Arab American Association of New York and the co-founder of the first Muslim online organizing platform, MPower Change. She is a member of the Justice League NYC, a leading force of activists, artists, youth and formerly incarcerated individuals committed to criminal justice reform through direct action and policy advocacy. We think Ms. Sarsour will contribute to the conversation which is about how to make the necessary societal and systemic changes needed to create a truly just society. She has been involved and lead organizing efforts on a multitude of issues. Some of her very successful campaigns include the Arab American Association of New York and Black Lives Matter (specifically bringing about an end to ‘stop and frisk’ policy by NY police), has been recognized by the Obama White House as a “Champion of Change”. This conversation is about doing work that makes people uncomfortable. For those learning about this work, it means addressing bias, processing why we respond in particular ways and figuring out a good way forward. It’s important to have these conversations together across communities and support each other in this process. SPCW holds that it is possible to support Palestinians, a Palestinian homeland, criticize the Israeli government and not be anti-Semitic. Having thoughtful voices heard from different perspectives is essential to serious and nuanced discussion. We find it very difficult to believe that the Obama administration would grant an award to someone with anti-Semitic views. It is also important to note that colonialism played a role in the establishment of Israel. Recognizing this does not in anyway seek to minimize the horror of the Holocaust or that the then world’s leaders failed to act in support of the Jewish People. However, the Palestinians claim equal rights and history to that same land. Here in Canada, our history of colonialism has also done significant harm and created division. Connecting the dots between the processes and recognizing the similarities of these local and distant struggles should help us not repeat this history. Given how the march and resulting organization came together so quickly and spread so widely, expecting one perfectly coalesced broad movement is unrealistic. Ms. Sarsour’s work speaks to the difficult conversations that have to be fleshed out for movements to be keep moving forward. Ms. Loreto received an inordinate amount of negative reaction due to a tweet taken out of context surrounding the Humboldt bus crash tragedy. Ms. Loreto regularly comments on current events in Canada. She is actively writing on topics including labour, politics, public policy and current affairs. She commented on the tragedy as many others did. In a series of tweets, she both expressed sorrow and support for the victims and she did not say that the victims of that crash should not receive help. She simply pointed out that other groups have not received that same sort of support. Ms. Spillett is a tremendous community advocate. Her work is always grounded in facts while it is infused with her innate humanity and deep sense of responsibility to speak out against injustice. At our 100th, we recognize that we must all be open to changing how we have approached inequity and injustice if we are truly to achieve our vision of a sustainable community that is just, equitable and caring. We hope that you will come out and be part of the discussion. Ps. New venue to be announced soon.